Anybody know what this ugly, red-eyed cuss is? I'm the last thing from a wildlife photographer, so I don't know one bird from another (I know only the gulls and grackels that cr*p on my boat). This shot was taken with a K10D/DA 50-200 yesterday in Lake Jackson, TX (about 45 miles south of Houston for those that might utilize geography to identify this bird). 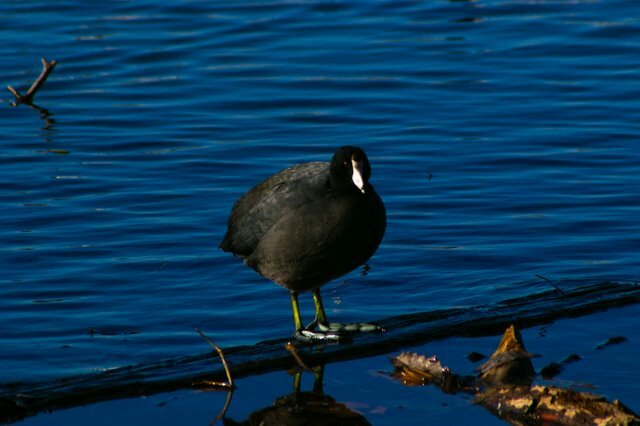 That's a coot - a very common bird here in Texas and elsewhere. Nice shot Jerry, and like Will says, a coot. I'm sure you've been called "you old coot" Well now you know what that means! So this is a coot. Indeed, I've been called one of the oldest of the old coots! Well look at it this way Jer, it's prettier than a buzzard. Me too NaClH20, but some have substituted the letters "uzz" in buzzard with the letters "ast" - always preceeded, of course, with the word "old". Gee Sailor, I have no idea what kind of bird that is. It would stand to reason though. Near a town with two main streets, one called "This Way" and the other called "That Way" there would probably be some wierd birds hanging around. [QUOTE=Sailor;16861]Me too NaClH20, but some have substituted the letters "uzz" in buzzard with the letters "ast" - always preceeded, of course, with the word "old". They never! Well, this is what I think you should do: Print out the coot photo 3X5, laminate it and carry it in your wallet. When someone accuses you of being an "old coot" whip out the 3X5, point to it and declame in a loud voice "this is a coot! do I look like that? Now do I?...don't answer!" Then walk away. People will think you're weird and avoid you. Here's a picture of a coot that I took this afternoon at the lake near our house. The whole gallery - and more coots, as well as pelicans, egrets, ducks and seagulls - can be seen here. I'm reasonably happy with this outing. I used the K100D with the Pentax 75-300 lens + Tamron 1.4x teleconverter, aided by the monopod that Santa gave me for Christmas. No kiddin', Eddy. Navigating downtown Lake Jackson makes you want to go "the other way". i have a pair that nest on the back of my boat sailor.. the swim platform is the perfect height for them..
they caught me out the first time they did it.. ended up with four eggs in it.. i always wtach for em now and clear the nest before they get started.. I live in the UK so they are very common birds.. we have something similar we call a moorhen.. the coots are slightly bigger..
ps.. me and my little boat..
Last edited by trog100; 01-10-2007 at 05:25 PM. Thanks, Will. I enjoyed your bird gallery, especially the picture of the white pelican (one bird I do know) "splashing down". I didn't realize pelicans of any kind inhabit fresh-water lakes - you learn something every day. We see the big brown ones all the time on Galveston Bay and in Kemah, but rarely do the white ones appear. I was surprised to learn this myself when we moved up to Dallas from Houston almost four years ago. We live now very close to where my wife lived over 30 years ago when we were dating; her mother (now 92) still lives in the same house. I don't recall seeing pelicans in the lake way back then but my memory of the past is getting weaker by the month. My previous experience with pelicans was mostly off the Atlantic shore in Kure Beach, North Carolina, where I have family and have vacationed many times. But we have pelicans here in our little inner city lake, as well as sea gulls (who must REALLY be lost). Can't remember if I was using the monopod for that shot or not. I really wish the EXIF info would tell me things like if I'm using a tripod/monopod, whether I'm using the converter or not, autofocus or manual, and a few other things. I used the monopod for quite a few of the shots but when I started trying to get the birds flying around, well, the monopod became a bit of an impediment and I ended up jettisoning it and shooting handheld. The light was good, luckily. Oh, trog, you'll be amused too that I started the shoot using Raw but gave it up after a while because with the K100D anyway, Raw is just too slow: can't shoot in continuous mode at all well. So half or more of those pictures came out of the camera as JPEGs. (30 ft) - but it has a skinny pole that sticks up. I've been trying to convince my wife that radar units are small enough to install on our boat, but she's not convinced. Luckily, I've been able to bring in a couple of new lenses under the radar, so to speak.